McDonald’s is the worst performer on the Dow Friday. A team of analysts at RBC Capital Markets downgraded the stock on “deteriorating industry conditions” and disappointing value menu sales. Still, the company’s long-term prospects remain strong. Watch the stock in real time here. Shares of McDonald’s are down almost 5% Friday after a team of analysts at RBC Capital Markets warned of a dim outlook for the fast-food industry. The fast-food giant announced its new dollar menu in January in an attempt to win back value-minded customers. But that prompted other chains to cut their prices as well. Still, investors don’t need to flee the stock because its long-term prospects remain strong. He thinks McDonald’s has numerous opportunities to boost same-store sales growth by creating “more effective value marketing, digital/delivery initiatives, product renovation,” he wrote. McDonald’s may benefit from the tax plan, Palmer wrote, saying that improving wage growth may get more customers into restaurants. International markets are also a particular “bright spot” because of the weak US dollar. 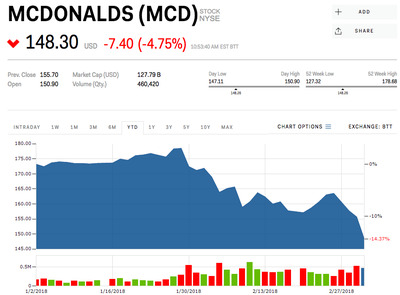 McDonald’s is down almost 14% this year.